The FUNSNAP remote controller adopts 2.4GHz radio transmission technology. A complete set of function keys for various operations and settings of the aircraft and the camera can be used at a transmission distance up to 100 meters. 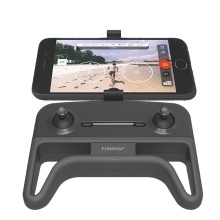 The remote controller can connect to a mobile device wireless and display HD pictures in real time through the FUNSNAP App.